I am still getting my hummingbird visitors, a variety of species and they are getting braver, but I have a whole new respect for the people who photograph them perfectly because believe me it is hard. Here are two from today. I was usig a very fast shutter speed and it still wasnt fast enough. I have decided that my flash skills arent good enough to work this one out so I have to make sure the bird is in good light, definitely sunshine LOL, and this is a small portion of the frame. 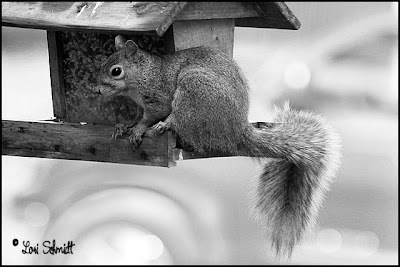 Using my 100mm macro lens I still was standing only 5 feet away from the feeder, stock still and waiting. They eventually come, you can hear their wings and as they are getting braver and not so scared of me I think I will get better shots. I just have to find somewhere to hang a shepherd's hook so that I can put the feeder in a better place and one which will be easier to set my camera up close without disturbing the bird. I had a long day, the last three have been actually. I have been riding Wiggle, Cayenne, little brat bucked me off LOL nothing bad but I hate roundpens, I asked her to canter/lope and she wasnt happy so I found my right leg being crushed between her and the bars so I just grabbed the top rail and let her carry on while I slid off her LOL. I used a lot of the panels for stabling last winter and havent rebuilt the roundpen so it is really small which doesnt help. My fault, I should never have tried to ask for a lope the first time riding her after months off. So I now sport a black and blue and purple and yellow knee and shin LOL. I will take a picture for the record promise. I did get back on her and rode her a bit longer before putting her up. Taxes is coming on nicely, poor boy he is a bit swollen in the nether regions but I got him out to exercise and it definitely helped get the swelling down. I wont post a pic of him with his swelling I dont want to offend anyone and it looks painful which I am sure it is. He is still trying to nip everything and everyone but he has definitely calmed down, when I led him out to the roundpen for his exercise he was very well behaved which is a first!!!! I went to my friend Tiffany's place on Thursday evening to try to set up a shot for a horse magazine cover using her one horse who is in show condition and a large truck. We were lucky enough to have one of the farmers with a nice truck and she had the horse looking good, the fields are still nice and flat because the crops are just starting to grow and are small (Tiff's place is surrounded by farm fields and is an awesome place to shoot at), and we had lovely blue skies. While I was there when we were fetching the horse this little turtle was waddling through the thick grass heading back to the small lake they have on their property, so of course I had to get pictures of it. 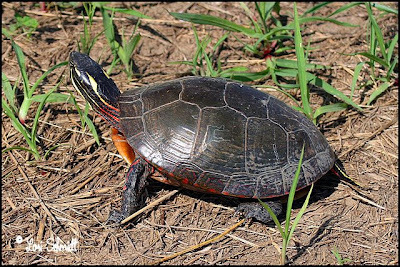 It turns out to be a Midland Painted Turtle . Quite a cute little critter. Poor little Taxes got the snip this afternoon and is not a very happy camper. He must be really sore, I have to keep him stalled until Monday which I have done in a stripped stall with new straw in it, then start working him on the lunge line (running in circles around me while I hold a long lead rope) for 20 minutes twice a day. I hope he forgives me. Well it is going on 10pm and I have only just got started on stuff on the computer, needed to re-edit a few pics from last Sunday's shoot which I have done and so far we are up to date with the picures they need. The rest are not going to be urgent so we will be able to allow a bit more time for those. The owner of the field finally found someone who would cut the field we wanted to use and bale it so we could move the horses on but she wanted us to get the horses there as soon as possible. She only called yesterday just before middday and I managed to get hold of Stan who, God Bless Him, waited for me to do a shoot in the evening and then came over with his trailer and helped me load four horses and get them to their new home. I sent the three two year old fillies and my filly Lori because she is looking a bit on the thin side. There is tonnes of grass there so I am going to have very fat horses by Fall for sure. I am so happy about that. 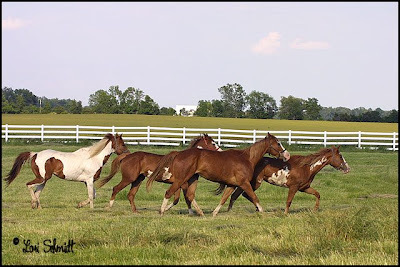 I have had a couple of very hectic days and am heading to bed now, hopefully tomorrow will be better but thought you might like to see some pics of the fillies in their new field. Taxes is getting gelded tomorrow. I am not looking forward to it, but he has just become too unmanageable to keep as a stud with no-one putting time in to train him. Have a great weekend all, my thoughts and prayers are going out to everyone around us who is suffering so badly with the floods, Mike I dont know if you are affected, I will go check your blog quickly but am keeping you in my thoughts. I spent a few hours at my new friend Lisa's place today with my Metz flash and a 2x converter which I had forgotten I had!!!! I put it on the 70-200 2.8 lens and the autofocus worked which I was really pleased about. I was trying to photograph the squirreols (they are nearly all black and in the shade on the wood very hard to photograph well. The camera converter and flash weighed a tonne so I would definitely need a monopod or tripod because I cant see myself lugging that thing around all day. I use the Metz 60 CT-4 but withut the auto adaptor so use it purely in manual mode. I came to the conclusion that this is not going to be the combination for shooting small moving objects in shade but I got a few shots that were a bit closer with the same set up and different backgrounds that I was well pleased with quality wise. 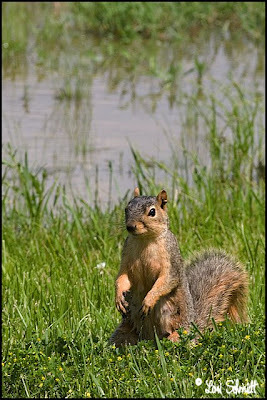 I did get one or two decent squirrel shots too. The kitty is her cat sitting complaining at us through the window, wondering what the heck we were doing crawling around on the grass with those objects in our hands. 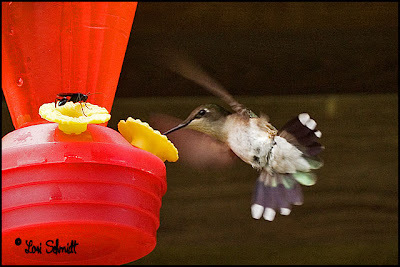 Lisa was worried that her humming birds were not coming over to her feeders anymore, but while we were sitting watching the birds around the feeder she has one little hummer came scurrying up a few times and I managed to pull off one shot. Not the greatest but I like it and it was pretty much full frame, I didnt have to crop a lot off of it to have it fill the frame. Well that is about it for today it is very late, they are building the fence along the railroad at last which is a relief. Gecko in answer to your question I only do editing on backgrounds, these were very quick ones. I do cut out a horse and put it on a new background but these were pretty much as shot. I will NEVER change anything to do with the look or performance of the horse so it is my job to know which lense to use, which angle to use and where the feet need to be placed. 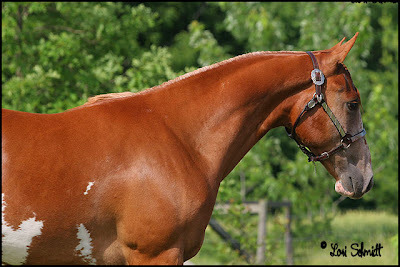 The owners worked all day prepping these horses for this shoot which took about 3 hours. They took about 7 hours preparing them, clipping manes, bathing etc. so it is a combined effort. 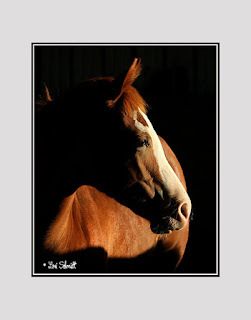 One of my regular clients has stacks of horses like we do and is trying to get some sold so decided that she needed to get me over to her place to get pictures of 10 (I think it was 10 I lost count) horses, from yearlings to older mares and their stud. 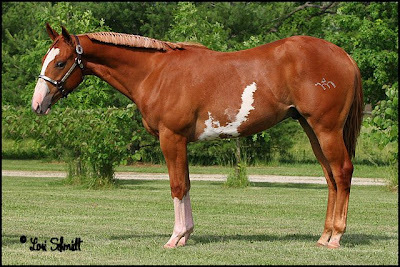 These two pics were of one of their two year old geldings who is for sale. I just finished as a huge storm started blowing up and drove home with it on my tail all the way home. I had been here 15 minutes when it hit us. We got half an inch but there was a lot of severe wind again. Today was just a day where nothing worked out the way it was supposed to be and now here I sit and it is going on 11pm and I need to go to bed. 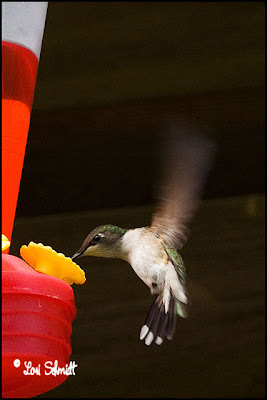 I mentioned yesterday that our aides husband had seen a hummingbird yesterday evening around the barn when he drove in. I got the "nectar" all prepared and went out to find somewhere to hang it where I could see it from inside. 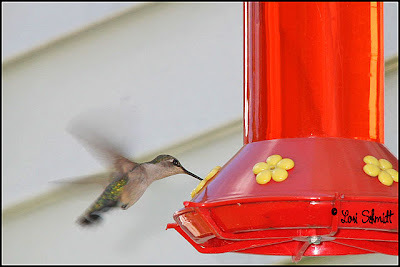 This morning I was on the porch and lo and behold there was a little hummer hovering around the feeder!!!!! I couldnt believe my eyes, didnt expect it to happen so quick. 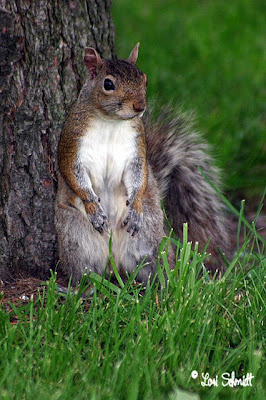 I grabbed my camera and went out and sat against a tree so I wasnt so obvious to see me and scare him away. He was darting back ad forth. I was a bit too far away really but I cropped this down a lot abd here is my first hummingbird photo!!!! I have lots of experimenting and practicing to do to get the right place and closer to the feeder But I was really pleased, it made my day. Nothing much happening today, it is very hot and humid again. I have to go to shoot some horses tomorrow afternoon other than that this is my life LOL. We started this morning with cloudy skies and a nice steady drizzle on and off which makes my pasture very happy and also makes it bearable to be outside for a change. Abraham asked about my 80-400 Tokina lens. I will never part with this lens it has done good work for me for maybe 12 years or more and was all I could afford when I needed this type of zoom lens. I dont know how they make them today but it is a metal lens, unlike all of the lower end lenses that they make with plastic casings etc. these days, so is pretty heavy. If the quality is as good as the one I have I would call it a bargain at $600. My only problem is that in low light with slower shutter speeds and bigger f stops the camera shake is more visible so it is hard to keep things in focus. Also I found that if I wanted to use it at the longest end of the zoom I couldnt get good pics unless it was on a tripod. My hands shake these days so that doesnt help. I have a beautiful Manfrotto monopod and tripod in England with my "friend" who has dissappeared with all my stuff, and a swivel ball head with pistol grip which I would love to get my hands on, it swivels whichever way you want when you squeeze the handle in with the camera mounted on top of it. This lens has shot literally tens of thousands of perfectly acceptable pictures for me on both film cameras and on digital, and yes it may not be as sharp as the top of the line Canons but it is a quarter of the price. I never had any quality problems but there again I dont photograph for billboards LOL. Most of the photo stock agencies want these huge digital files before they will accept them and then they have to be pin sharp etc. and the D30 files are a bit small for the main agency that I work with which is a shame because I have a lot of pictures that I could use there. 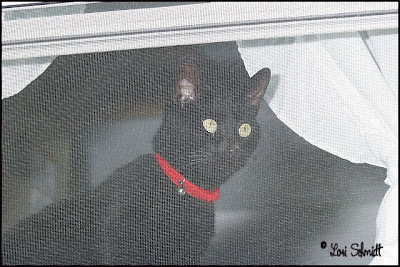 I am going to have to try to set up my own stock page on my site, just dont know how to go about it, will have to get Larry to figure it out for me, he is the computer guru LOL. 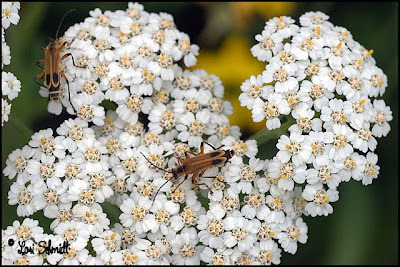 I also have the 100mm 2.8 macro Tokina lens which what I shoot all my macros and some of my portraits with which I bought at about the same time as the zoom and also a 20-35 3.5 - 4.5 Tokina (Wide angle) which I dont use much but have never had problems with. They were all bought at about the same time and are still going strong. 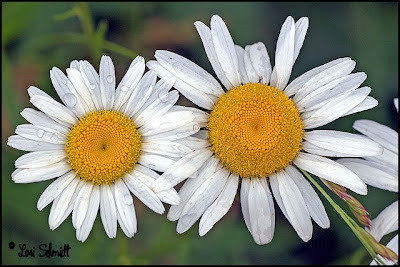 The two flower pics today were shot this morning with the Tokina 2.8 100mm macro and as you can see it is pin sharp. As I say I dont know if the manufacturing is the same today so can only vouch for the ones I have. I definitely need to get all of my kit in for service sometime but I just know that I will be miserable without a camera for the weeks it will take for them to be cleaned and serviced!!! Two other places I would recommend for used and new equipment to purchase online is KEH and B&H both based in New York. I havent bought much from B&H but have purchased most of my new and used equipment from KEH and would highly recommend them. 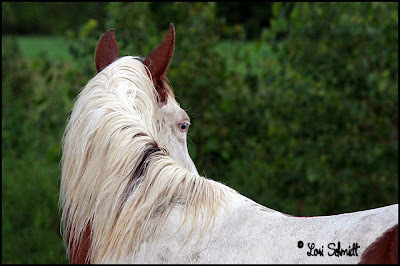 My horse photo today is one I snapped of Wiggle a few days ago when I was walking down to get the mail. I am starting to carry my camera with me, you just never know what you are going to see. The passion is starting to come back a little at a time. It has rained lightly all day on and off and it is just the type of rain we need to try to get the grass established in the field, although I suspect I am going to have to send soil samples in to see what nutrients I need for the soil to get a better growth. I recently met and made friends with a local gal, Lisa, here in town. She also has a passion for photography and a very good eye but was plugging away with a little point and shoot and I felt she could achieve so much more, so we set her up with a cheap D30 (the first digital camera put out by Canon). Consider this, I paid the equivalent of $3000 for my D30 a few months after they had been released, replacement batteries were about $90 and Compact Flash card worked at about $2 per megabyte, so 128 mb was $250 odd and all of this only 7 years ago) Now you can pick one up for around $200!!!!! They are still good cameras, the file size is smaller (3.5 Megabyte files) but you can print poster sized prints from it happily if you are not a serious pro photographer who needs these huge files to keep clients happy. She has lovely green grass and old maple and oak type trees al over the place there and some empty plots that are kept mowed and has tonnes of squirrels, birds and rabbits. I went there this evening and tried to shoot a few shots but I tried using my 80-400 Tokina that has been my workhorse for about 11 years with no service and tends to be soft at the long end and they were all in the shade so I didnt get terribly sharp photos. I was hoping to get use out of the extra zoom. My hands are shaking badly at the moment so I could have done with a monopod or tripod too. Some of them were okay for web use and smaller prints, I need a converter for my Canon 70-200 2.8 and I will be going back for more pics, this time I will take peanuts or something and try to entice them closer so I can fill the frame better. These are just a few that I shot. I will do the rest tomorrow. 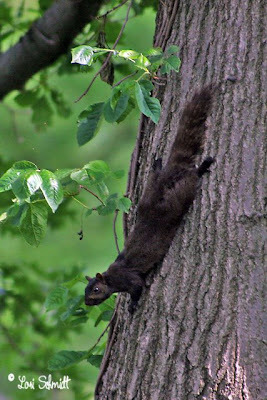 There are a lot of black squirrels and some that look as if they are crossed, brown tail black body, one with black rings around its tail like a racoon!!!! Of course they love the bird feeder and this guy just couldnt resist the food so we managed to keep him coming back for more. This one looked better in B&W because there was a bright red car in the background! So enjoy the squirrels guys. Sylvester caught and killed a chipmunk this morning and very gently brought it to me so I could see it, it had no marks on it at all. Of course I had to take photos of it because I can never get close enough to them to shoot them, and then resigned myself that he was going to be a kitty meal. I know they are rodents but it breaks my heart, I just think of Alvin and all those guys LOL. Abe I know you dont like cats and this is probably one of the reasons, but without my cats my barn would be over run by mice believe me, they do a good job. Our aide said her husband came out this evening to get something from her while she was here and he saw a hummingbird by our barn. 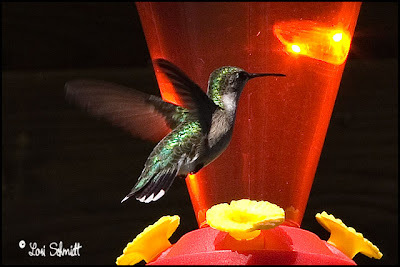 I am going to get my hummingbird feeder set up tomorrow for sure!!!! Hope you all had a good day, it was a bit cooler today but not much and no rain. 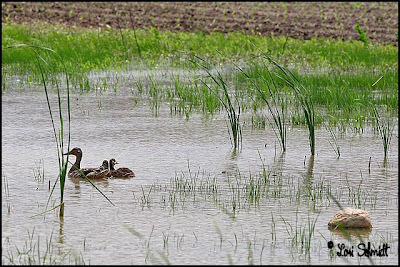 Flooding in and around the state is still very bad. Keep tose people in your prayers and their animals. I went over to a friend to photograph an item that he is going to try to sell and needs pics for his website etc. He is actually our veterinarian and Larry has known him all his life. They stay in a house i the country surrounded by corn and bean fields and which still has some old and new barns on it. This one is the oldest one attached to the side of a newer shelter and as you can see it had quite a lot of old straw bales which had been in the loft for many years. During this last winter, the roof just collapsed and this is what is left. I have some other angles too. 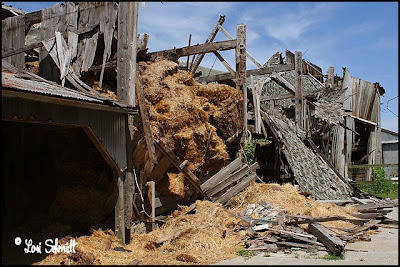 There are people in town here that are dismantling these old barns, they werent built with nails and screws they were built when the pillars and frame were cut for them to slot into each other. A lot of the wood is oak so is still good and they are building, small portable buildings out of the remnants and selling them, as site offices etc., easily moved. I hate to see the old barns go but am glad that someone is at least giving them a new life. I will try to get a picture of the stockpile they have and the buildings they are producing from this very old lumber. This is also another bit of past that is leaving us. This is quite near our house and the railway track is no longer used so they are pulling the railway ties and rails up at the moment. This is the one viaduct going under the rails but it is really starting to fall to pieces. 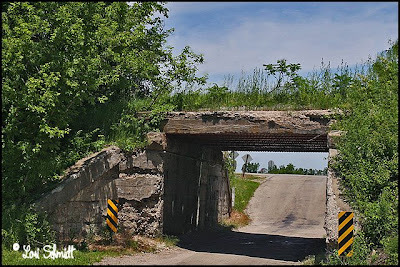 They have been using these old track sites to convert into trails for cyclists, runners and walkers all over Indiana and I think they are planning on making this old route into one of them too. I just hope they make a horse trail next to it so that us riders can enjoy it as well. The cyclists and walkers dont want to have to deal with horse poop on their pavement LOL. Guess we will have to get like the dog owners and have a pooper scooper with us so we can pick up after them!! Well that is all I really got done today. No horses again I am afraid but I am getting to see a bit of my surrounds as well and capturing it before it dissappears. The old railway station is still there in town but they have already pulled up the tracks so I missed that opportunity, but I am going to try to photograph that one of these evenings. No rain today and not as hot, still in 80s but a lot more pleasant. 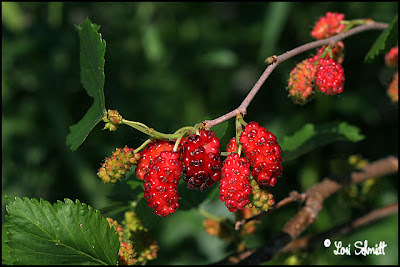 Yesterdays berries are indeed mulberries, it brings back memories of my making mulberry jam (or jelly as it is called in the US). Maybe I can get enough to do some too before the birds get them all. We have another tree down in the feld. Also have lots of blackberries growing around here. We got hit quite hard with a storm yesterday evening at about 4.30pm, just over half an inch, then at 3am this morning we got slammed with another one which yielded just over an inch and 60mph winds or something rediculous!!! I have a horrible suspiscion my little grass seeds were not established enough to hold them in place during that deluge and had been washsed away but the oats is still there LOL. No horses to photograph today, they are all muddy and looking terrible but I noticed this bush growing out the back of the cabin with this fruit on it. 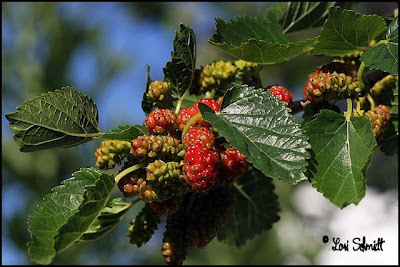 I am sure it is a mulberry bush, time will tell if they turn darker, a sort of purplish color. It is definitely a tree and not like the black or blue berries and raspberries that grow on vines. We hae been lucky because most of the state has been declared a disaster area and there are thousands of people with their homes still under water. We can only hope that the rain will calm itself down so that everyone can get their lives back together in some sort of way. So nothing exciting I am afraid but I thought they were quite colorful. I have some peacock feathers which a friend gave me that I have been dying to photograph forever but havent had the time to set it up the way I want to so hopefully I will get to that tomorrow. 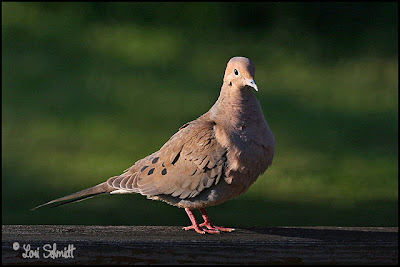 Thanks Abe, this is a mourning dove, it just has the spot on the side of its neck, I also checked if it was a turtle dove but that it isnt LOL. 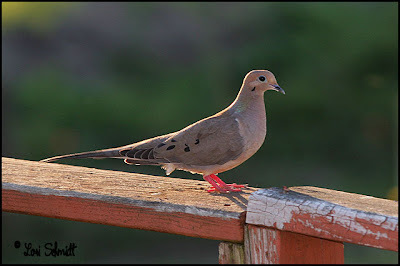 It would appear that most of the doves around here are of this variety, I dont think I have seen the ring necked here at all. RR I agree I would love to trade off some of our heat for your cold, we are sitting in the upper 80s again today and the state is getting hit hard with storms and rain and tornados, while I normally complain about our little pocket of land always missing the rain like it did last year, this year I am glad because most of the state is being declared a disaster area almost because we have such bad flooding, and the states around us. I wish I could find a climate where it is just pleasant all year round LOL wishful thinking. The stress is mounting as I think that I am not going to be able to use the pasture down the road that I used last year. The owners are having health problems and we have been having problems finding someone to bale the four foot high grass that has grown there already. The owners want it cut and baled before we put any animals on it, but we went over to see her today and I get the feeling that because of her health and her husband's moreso, it is not going to happen. They are more likely to sell the place off. If I had the money I would snap it up in a flash, it is a really nice place and has a total of 32 acres, most of which they rent out to farmers. I will post again later and hopefuly be able to find a picture to go with it but I am just so stressed at the moment I could dig a hole and bury myself in it LOL. Look at those teeth LOL!!!!!! This was Dee, one of the two year old fillies stretching under the electric wire without shocking herself to get the little bits of green grass that were sticking up. Quite a set of chompers there LOL and a very dirty nose! I caught this little guy outside the kitchen window again a few days ago, I liked the way he was lit by the setting sun from the back and I used fill flash to brighten up the shadows and it worked nicely. It has been very humid today, not quite as hot, but overcast all day. We had a bit of rain on and off. Last night's storm only yielded 1/10th of an inch of rain so we were on the edge again, thank heavens because if it had been worse my old refridgerator would have been sitting in my driveway not just 6 feet further down the deck from where it had been before the storm LOL. You can't describe the intensity of these storms to people who have not exerienced them. They are there one minute and gone the next and sometimes just the straight line winds, not even tornados leave chaos in their wake in a matter of minutes. It is pretty scary. The trees will blow so that they are nearly horizontal to the ground, big trees. Nature is a powerful and beautiful thing and I have the greatest respect for it. Abe I think this little dove is a Mourning Dove? It doesnt have the ring around its neck so I am assuming that it what it is. I am just too lazy to look it up LOL. I got the urge to go out and groom saddle, lunge and ride Cayenne in the bottom of the barn today. I havent ridden or had the inclination to for 6 or 8 months so when I got the urge I acted on it right away. I didnt ride for long because I still have part of the bottom of the barn taken up with stalls so it was hard to do more than a small circle. We did a bit of flexion, (neck bending) bringing her nose to touch my foot each way and then did a bit of walking and trotting in each direction. I want to start trail riding and she will be my first project because she has had the most riding time (3 weeks!!!) of all of them and I need to get her sold. So if my burst of enthusiasm continues and I ride her every day this week, maybe I can take her out on the trails for a ride next weekend. She is such a willing enthusiastic filly and I would love to see her go to a loving home where she will get loved back. 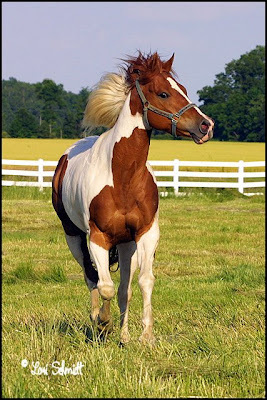 She will come and try to put her head into the halter for you when you come near her with one, just gets so excited and intense and eager to please. I wish I could get a picture of Taxes for you with someone standing next to him because you are all not going to believe how big he is, but I dont have anyone to hold him and he is naughty LOL. That's it for today, I have to say it was nice to be sitting up on a horse's back again even if it was short and sweet - I am out there alone so if anything should happen it would not be good - so I usually make sure there is someone around when I ride. 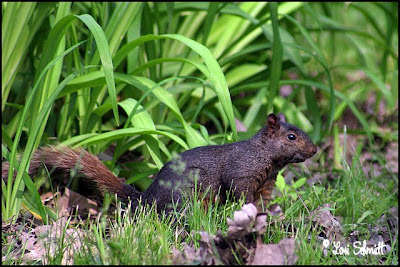 This darned squirrel has been avoiding me and I am determined to get a decent picture of it that I can use for something so I try to carry my camera everywhere now. 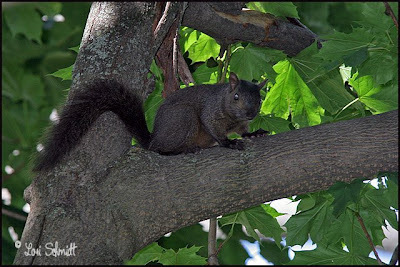 I was hoping to see some black squirrels around town, there are normally stacks in the gardens but today I only fleetingly saw 2 so no joy. 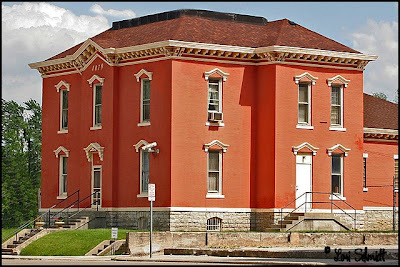 I did the shopping and after putting the groceries in the van looked across the street at some of the old buildings that are still standing in the square around our courthouse. Some of these buildings are being torn down now so I decided that I better get some pictures of what is left while I can. 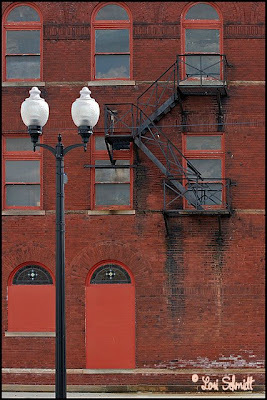 Unfortunately I didnt have my wide angle lens so managed a tight crop on an interesting fire escape on one and another building down the road which used to be the jailhouse, and was built in 1879 which I had to crop the back off of because there were cars parked there. I will definitely be going back with my wide angle at a better time of day so I can get better shots of these old treasures. We had an intense storm late this evening, I was worried about tornados, the clouds were like an encroaching wall of pitch black and the wind was gusting so hard that it blew our old refrigerator which is standing on the deck outside (and is not on wheels I might add) about 6 feet along the deck!!!! It didnt last long but it watered my new pasture nicely, we are seeing more of the oats coming through now, just waiting on the grass seed which is much finer and will take longer to see. It was gone as fast as it came but I got drenched in the process and had flying missiles all over the show, barrel lids and anything small enough to get blown by the wind went skating off down the driveway and I had to go back and retrieve them LOL. Well that's about it for the day. We reached 90 degrees F again, this weather is weird! ((((Hugs)))) and have a nice weekend everyone. CG (Julie) thanks for your continued visits, you are always on my mind. Wow this is typical for this part of USA, the transition from the heat to cold is very quick and there is very little pleasant weather in between. We are already experiencing temps of 90 when a few weeks ago we were freezing LOL. I Got My Squirrel today on my way back from town!!!!! He was a bit far away so I had to crop the frame quite a bit but I will persist and get the shot I want. 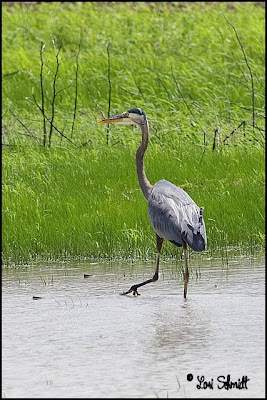 I also saw this heron and these ducks on the way back and again they were a bit far off so are cropped quite drastically but I enjoyed seeing them, and I forced myself to stop and photograph them, where I would normally just drive by and then regret not taking the photo later. There wont be much use for them except on the web but I like them to add to my collection. Went and fetched some more hay, my supplier will deliver the trailer tomorrow hopefully but they are so busy sith their crops right now and it isnt really a hassle for me to just go a few miles to pick up a few bales at a time, only problem is that as I got back from Muncie in my truck this afternoon my brakes decided to give up, fortunately very near home and I managed to get back home safely in 1st gear and just hope it would coast to a stop where I normally park without running into something LOL. 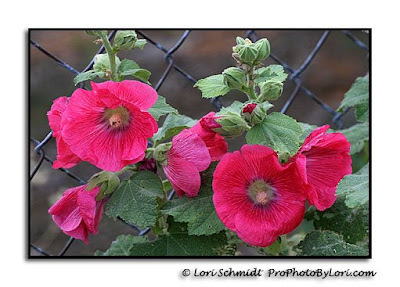 Well that's it for today, Oh yes Abraham I found a picture I took a few years ago that I think is a holly hock, very pretty flowers thought I would post it for you. 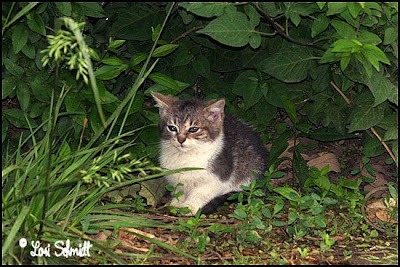 Today's pictures are two of the very few I have shot recently, the Dove was outside the bathroom window and I only got this one shot off, late evening, and the kitten was in the bushes with its momma a little distance away while I was getting some scrap dumped at the junk yard yesterday. Once again I have got seriously behind on my blog and regret my lack of motivation every day after the day is over and there is nothing I can do about it!!! Part of the process I suppose. We managed to dodge the storm from my last post, the tornados came pretty close but because it was cooler and later in the night by the time the storm got to us we didnt get hit hard and had just under an inch of rain which was fabulous for my new pasture that I had just tilled and planted. 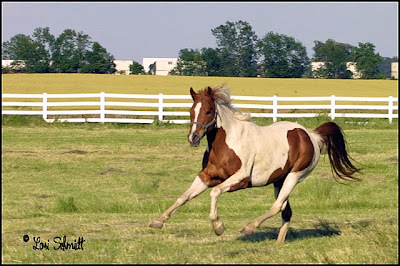 We had another round of storms yesterday, also very severe with tornados etc, Indianapolis has been hit hard in these last two, and lots of wind but only 8 tenths of an inch when I got up this morning, so once again we were spared the ferocity but had enough to benefit my pasture again. I have hardly picked my camera up in weeks, we have gone to temps in the 80s and up to 90 again in a few short weeks, spring and fall dont last long here LOL. Either too hot or too cold. Hay seems to be better this year, my guy hasnt done his first cutting of alfalfa yet, if it remains clear he will probably do that next week. I am waiting to hear what he is going to charge this year because his number of bales should be up over the crop last year which was less than half his normal crop, but then diesel has climbed to over $5.40 a gallon so it may keep the hay prices up there. I have had a squirrel tormenting me, giving me perfect photo opportunities within range of my lens whenever I dont have my camera and being absent when I do!!!!! Strawberry Lane I was driving down the road the other day and there were two Canadian Geese waddling along next to a pond with their two little goslings. I thought of you immediately, and yes, again I didnt have my camera!!!! I will try to capture a picture of them if I see them again as they tend to hang around this area and probably will be there as long as their youngsters can't fly. I just dont want to upset them by intruding into their space. Nothing much else happening around here, getting chores around the property done slowly but surely which makes Larry happy because he likes things neat and I let it turn into a forest outside. 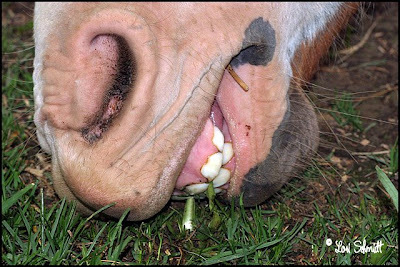 I would rather have my horses eating the lawn than cut it down LOL but then they would rip the soil all up and there would be hoof prints everywhere.